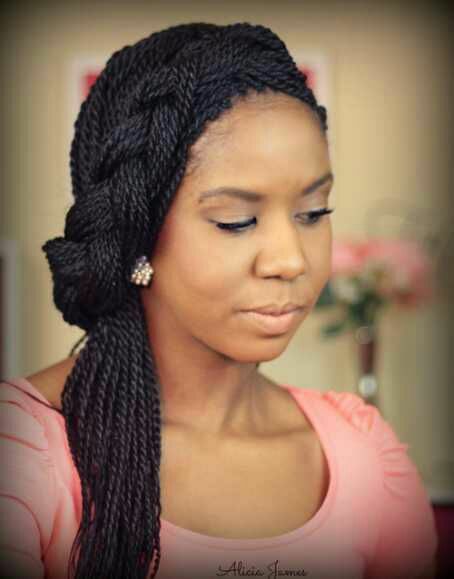 Big Box Braids or Twists (African braids ) - BlogIT with OLIVIA!!! African hairs are usually not too easy to braid due to hard hair texture or should I just say rough?? I really do have such stubborn hair and this is the major reason why some ladies just prefer braids to ordinary fixing of extensions. When you braid, you will save yourself the stress of having to brush out your Weavon every morning before leaving for work. This styling can be done both on twists or box braids. It all entails using your hands to pull half your front braids to the side. Then weave it sideways and tuck the stray to the back with other braids..
You can wear this look for a night out with friends or even when hitting at a bar. It just makes one's beauty a bit pronounced and fabulous.